Yeah, this happened here in Oregon, but it was Albany, not Pendleton. But you can still take your chances at the Spring Poker Round Up starting next week at WIldhorse Casino in Eastern Oregon. Thirteen events over eleven days, with buyins ranging from $125 to $550 for the Main Event and a High Roller at $1,100, plus some satellites. Last spring, Lisa Meredith won the first event, with 529 entries, then she went on to take third place at the WSOP Millionaire Maker (7,190) for a prize nearly ten times the prize pool of the Pendleton event. Two years ago, Angela Jordison swept the first three events, so if you’re a female player and you want the good poker juju, this may be the series for you. That, and it’s well-situated to build up a bankroll for anyone just a couple months before the WSOP starts. #4 – Sunday, 9 April, 7pm – Big O, $230 with $1K added to the prize pool. This is a new event at Pendleton, though there’s plenty of cash game Big O action. #5 – Monday, 10 April, noon – Limit Omaha Hi/Lo, $230 with $3K added. $38K prize pool last year. #6 – Tuesday, 11 April, noon – HORSE, $230 with $3K added. $23K last year. #9 – Thursday, 13 April, noon – NLHE High Roller, $1,100 (satellites at 7pm 10 April and 12 April). $72K last year. #12 – Saturday & Sunday, 15 & 16 April, noon – NLHE Main Event, $550 with $10K added (satellites at 7pm 6 April and 14 April). $172K last year. I’ve been writing this blog for more than six years, so there’s a lot of stuff from the early days even I don’t remember. A brief examination of Qx7x. A sad tale of recovery and loss. The time a couple of friends compared me to Gus Hansen. 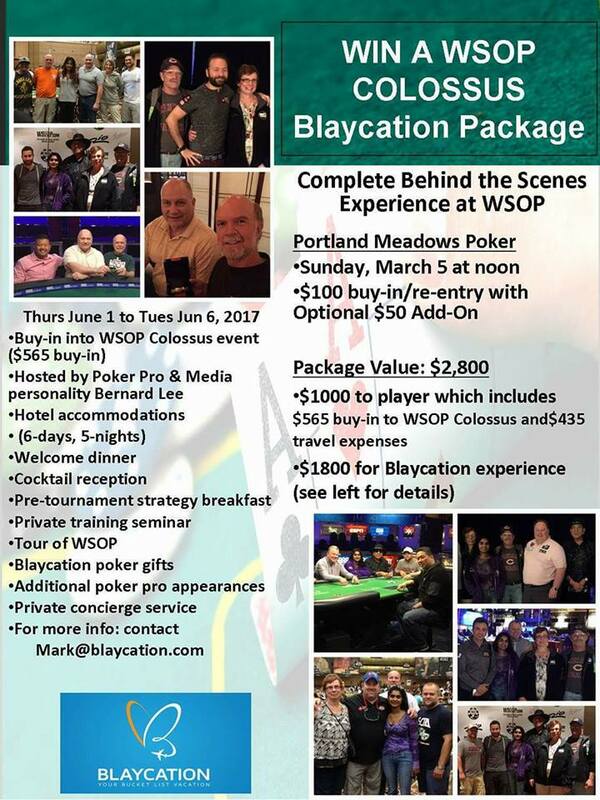 The big event in Portland poker is happening in Salem today and it may be over by the time you read this. 1pm is the hearing on House Bill 2190, which would draw the definitions of the state’s social gaming rules in a manner that would choke out poker as we’ve come to know it in the city. And, of course, there was last week’s article in Willamette Week by Nigel Jacquiss. It wasn’t one of the best efforts by Jacquiss (who has a Pulitzer Prize under his belt) with his description of Final Table as “a room that smells like a mixture of air freshener, fear and fryer grease.” (Unless it was his own fear, perhaps.) He padded the account with a portrayal of the late John Ogai and quotes from the more-recently-passed Chris Vetter without including material from several sources I know were interviewed extensively in the main body of the article. He didn’t reconcile the claim that the clubs were operating illegally with the fact that the city has allowed their operation for most of a decade. It’s only in a sidebar that he mentions “Portland’s poker rooms are licensed and operating openly. Yet several of their practices appear to violate the law.” There’s certainly a gray area—much as recreational marijuana sales are legal in Oregon but not legal under federal statutes—but it’s not as clear-cut as he portrays it in the article. The last event of this year’s Bicycle Casino Winnin’ o’ the Green, a $200K GTD Monster Stack tournament with $245 buyin has entries today and Thursday. The Mid-States Poker Tour at Golden Gates Poker Room in Black Hawk, Colorado has three entry days for its $200K GTD Main Event ($1,100 entry) Thursday through Saturday. Tomorrow is the first of three entry days to the $529,850 GTD Main Event of the Planet Hollywood Goliath Warm Up. The Venetian Deepstack Extravaganza III has a $600 entry $200K GTD Bounty tournament with three entry days starting Sunday. Sunday evening is a $7K GTD $250 PLO/PLO8 mix. Little Creek Casino is running WSOP package satellites on the next four Tuesdays at 7pm. $255 buyin plus a dealer addon, every 10 players in the tournament gets an entry to the $1,500 Millionaire Maker and $750 in travel expenses. The Heartland Poker Tour opens today in St. Charles, Missouri with a $350 buyin, $100K GTD. The Council Bluffs World Series of Poker Circuit begins tomorrow. It’s one of the smaller stops on the Circuit, with 321 players for last year’s Main Event. The Liz Flynt Spring Poker Classic at Hustler Casino in Gardena, California starts Friday with satellites for the $150K GTD event over the weekend. Saturday and Sunday both have 2 flights each ($250 entry). The 12:30pm flight gets 20K in chips and 12% make it to Day 2. The 5pm flight gets 24K, and 4% advance. If you qualify more than once, you get $1K for any stack not played. Peppermill Casino hosts another Run It Up Reno beginning on Monday. The first day has a $20K GTD (with seats to the Main Event added) and a 6-Max PLO tournament. The Wildhorse Spring Poker Round-Up starts next Thursday (see above). Elk Valley Casino in Crescent City, California has a WSOP Main Event Satellite on 7 & 8 April. There are two qualifying sessions (6pm on the 7th, 10am on the 8th), with the final session at 4pm on the 8th. Entry is $250, with 1st place receiving the Main Event seat and $2K in expenses. Maximum of 160 players. The first event of the WPTDeepstacks Thunder Valley is 7 April, with a $260 buyin $100K GTD 8-Max. Entry flights on Friday and Saturday (two) with Day 2 on Sunday. I made an appearance on the High Roller Radio podcast a few months back, but I’m not nearly as entertaining or experienced as Abe Limon, late of Live at the Bike and other ventures. PokerSesh is no more, but HRR interviewed him this week, shortly after the Mike Dentale/Cate Hall heads-up match (Do I care about that enough to link? I do not.) He has a few words to say on the “poker/industrial complex” (actually, he says those particular words quite a few times), staking, and poker player rating systems. 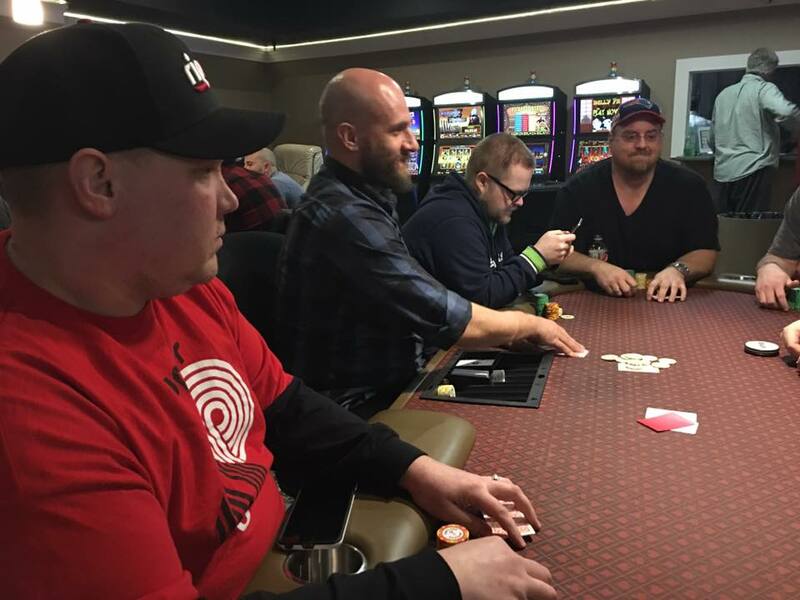 Former Portland-area player James “SplitSuit” Sweeney, co-founder of the Red Chip Poker training site, has a primer for playing “Big-O,” if you’ve been looking enviously over from your NLHE table at the people having fun next door. All those cards! Here is what I’m contemplating now. I am going to play the smaller game tonight only and if I lose, everything is as normal except for I still will be showing all of my hands and non-showdown pots to let the others know what I was betting with. If I win I’m going to DONATE all of my winnings back to the table for everyone who was there when I quit (I do plan on playing until 230am). My profits will be divided based on the number of hours the players played in the smaller game. (The more hours you played the smaller game with me the higher % of profits you will receive) This offer is only good towards the NEWEW, smaller game players, none of the regulars from our regular $1/2 game can get this offer. I expect to win anywhere from $300 to $1000 in this game. If I lose, it’s all on me obviously. Game is on for 7pm tonight. I’ve been itching to play this game myself.Gonna have to wait a couple of weeks, though. Jeremy’s game was still going with a couple of tables as of 11:30pm Tuesday. BTW, just because I haven’t been playing live since I won the Portland Poker Championship Series trophy, I haven’t been completely slacking off. I picked up a satellite ticket to the Ignition Black Spade Poker Open Main Event, a $300K GTD NLHE tournament taking place on the opening weekend of the Pendleton Spring Poker Round Up. LATE ADDITION: Published this morning after I went to bed is the Willamette Week article I mentioned was due to come out. Nothing special that I’m aware of this week, but I’m eager to see the new RFID table at Portland Meadows setup; Brian Sarchi told me last week that the computer’s up and running and that the cameras were going to be installed. Here’s some info from Gorilla Gaming about the tables (similar to those used by the WSOP, HPT, Bicycle Casino, and others). 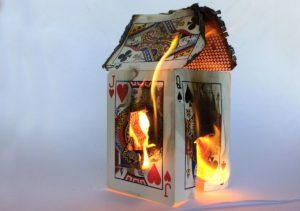 If you’re interested in the technology behind reading the cards and putting live hands on a screen (I downloaded the software a couple of years ago, you can use it in a limited way without a hole-cam or RFID table) read about PokerGFX here. At The Bike, the Winnin’ o’ the Green moves into the final week with Mega Millions XVI, a $1M GTD tournament with a $160 minimum buyin. There are two flights (with optional $100 addon) through Monday. Day 2 is on Tuesday. The last event begins Tuesday, a $200K GTD Monster Stack tournament with $245 buyin and entries through Thursday. The $200K GTD Main Event ($1,100 buyin) of the WPTDeepstacks Reno at the Atlantis starts Friday and runs until Monday. The first event of the Mid-States Poker Tour at Golden Gates Poker Room in Black Hawk, Colorado is Thursday, a $100K GTD, $360 buyin. Friday is the start of the Planet Hollywood Goliath Warm Up, with $1M in combined guarantees, including the $529,850 HTD Main Event with a $1,650 buyin, three entry days (30 March–1 April). Vancouver, BC’s Edgewater Casino has a Super Saturday tournament at 10:15am with w C$500 buyin. Tulalip’s Last Sunday of the Month tournament is Sunday for a $290 buyin (with dealer addon) $25K GTD tournament with 30-minute levels. They’re also offering a weekly $60 No Chop NLHE tournament on Sundays. The Venetian Deepstack Extravaganza III starts Monday, with a $150K GTD (three entry days, $400 buyin, 11am start time). 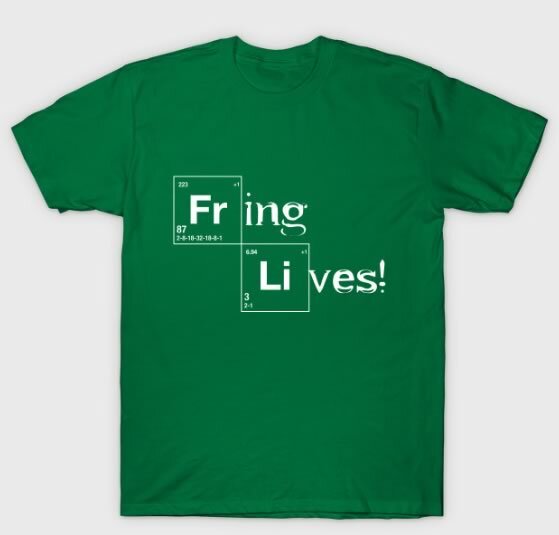 The series runs through mid-April. 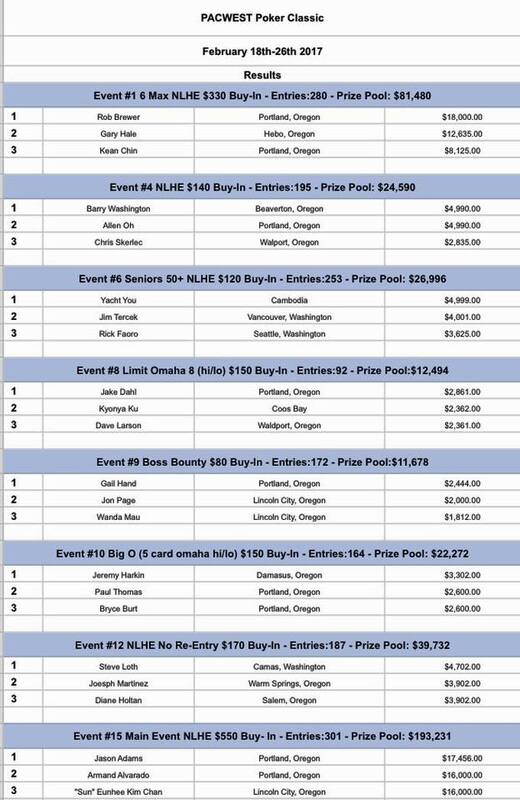 Little Creek Casino in Shelton, Washington has another satellite for a WSOP Colossus buyin and $750 in travel expenses next Tuesday night at 7pm. Tickets are available online. There are three Millionaire Maker packages up for grabs on Tuesdays in April. The Heartland Poker Tour hits St. Charles, Missouri, outside of St. Louis a week from tomorrow with an opening $350 buyin, $100K GTD. Their $1,650 buyin Main Event (live streamed, no longer televised) starts 7 April. Alaska and Southwest both have direct flights to St. Louis from PDX, you can get RT tickets on Alaska for about $425. (St. Charles is about 8 miles from the airport). Another direct destination you may not be aware of is Omaha, just across the Mississippi River from Council Bluffs where the World Series of Poker Circuit lands 30 March. Direct roundtrip flights on Alaska are about $450. For a town near Omaha, you’d think there might be more than a single Omaha tournament on the schedule, but Council Bluffs it is Iowa, not Nebraska. LA’s Hustler Casino has its annual Liz Flynt Spring Poker Classic starting 31 March. The series has over $1M in guarantees, with a $500K GTD Quantum tournament near the end and a two-entry-day $250K near the start ($250 buyin). Peppermill Casino hosts another Run It Up Reno from 3–10 April. It includes a number of small buyin events, including 6-Max Triple Stud and PLO, a 6-Max 8-Game championship, a NLHE Partner tournament, Win the Button, NL Omaha Bounty, Big O, and 3-Card NLHE. The topper is a 2-day $100K GTD NLHE Main Event with a $600 entry. Most of the buyins are $125 to $225. The Black Spade Poker Open 6 is running on Ignition Casino, and I popped into one of the $33 satellites for the $450 $300K GTD Main Event next month. One seat was guaranteed, the game got 15 entries (with $30 of the entry going to the prize pool), so it just made the nut with no overlay and no extra money. I was a few minutes late, I started off with 1500 chips at 30/60 but let’s just say that anything that happened in the first 35 hands didn’t matter. HJ opens with 9♠9♥ and I call. SB has K♥K♠ and squeezes for 2,515. BB and HJ fold, I stupidly call for almost all of my chips, and the board runs out A♥4♣4♥6♥T♠, leaving me holding a bit more than a couple hundred chips. Whoops! I’ve had three abysmal hands in a row, and here I’m all in for three-quarters of a big blind. Action folds to the button (Player 6 in this anonymous tournament), who raises to 600 with 4♠4♣. SB folds and the board runs out 6♥5♠7♥7♦A♥ just missing a straight and giving my tens a win. CO (Player 6, again) opens to 600, I’m already in for a third of my chips and put the rest in. He shows T♠J♠, the board is 9♥A♥6♣2♦9♠ and he doubles me up again. We’re short-handed with only thee players out of the blinds. They fold and I shove. BB has nearly five times my chips and defends with 7♦4♥. We both pair on the flop and I avoid another loss: 9♦7♠3♠A♣5♥. We’re five-handed. I shove and take the pot. UTG raises to 500 with 9♣A♠ off a stack of 9000. Nobody calls. I shove and he folds. I open with a shove and the button re-shoves for 3250. He has Q♦A♣ and we’re heads up going to the flop. I hit a set but have to dodge a gutshot draw in the river. : 9♣T♣4♦K♦7♦. Middle pairs. I sort of hate them, but we start the hand with only four players, so I raise to 900. SB has J♠A♣ and calls, BB has 4♦4♥ and comes along as well. The flop is T♦A♥8♥, it’s checked to me and I bet 1000. SB calls with his ace and the BB folds. I shut down on the K♣ turn when it’s checked to me; the river is J♦, SB checks, I check, and he (Player 6) takes the pot. We’re on the second hand with just three players (having lost a short stack between this and the previous hand I entered). The button min-raises K♦J♦, SB calls with A♣6♠ and nearly 100bb. I shove and they both fold. I shove and the blinds fold 6♥3♣ and J♠9♣. I shove a crummy king, SB reshoves for another 1100 chips, and he has J♦J♥.The board runs out 3♣3♦7♠A♣7♣ and I boat up to beat the jacks. We’re still 3-handed. BTN shoves for 1066, SB folds, and I call for 766 on top of the big blind. This time the chips go the other way after a K♠5♣6♦6♥2♥. My flopped two pair gets busted by trip sixes on a runout of [ks5c]6♦6♥J♥. One of those annoying times when action folds to your big hand, you raise, and the short stack just has 3♠T♥ so he doesn’t call. I raise to 1200, SB folds, BB shoves 13K and I know I’m behind but cross my fingers. It works, as I’m right about being behind Q♠Q♣, but the cards give me the literal nuts: 7♦4♥6♣2♣K♣. We’re still at three players. The short stack has only 1852 chips and puts 1600 into the pot preflop with 9♥8♥. Both of us in the blinds come along, though Player 6 in the SB is down to 5360. The flop is 6♥K♠7♣ and I figure my middle pair is good enough to call the last 200 or so chips the button puts in after the blinds are both checked. The turn is 4♦ and the river is 2♣, he misses his straight and my pair of sevens holds (SB folded Q♥9♠). It’s the first hand of heads-up and Player 6 is the big blind. I have a 4.5:1 chip advantage. Just over 40 hands ago, I was all in for less than the big blind and I doubled up twice through the player I’m now facing. I have a good shot at the $450 ticket to the $300K guarantee. There is no second prize. I raise to 1200 and he folds 9♣8♥. Player 6 raises to 1280, with just 2000 behind. He has K♥9♥ and I start off behind roughly 40%/60%. The flop is 5♠2♥A♠, which actually gives me the lead by about 10%. Even if he has top two pair, my odds haven’t gotten any worse. We both check. The turn 7♥ gives me a pair. He has a flush draw, but he’s still behind 70%/30% and even if he wins I’ll still have a substantial lead. I check, he shoves, and I call. The river is the 8♣, my pair wins the hand and I’m playing the $300K next month. As of Saturday, just after midnight (so technically Sunday morning) the Poker Mutant is the reigning champion of tournament poker in Portland. One thing I want to clarify: what I won was the trophy for series champion. And I did it without winning very much money. I consider myself a decent player (like, who doesn’t? ), and I have shared in some big-for-Portland prize pools, with cashes in the several-thousand-dollar range. But I’m under no delusion that I’m the best player in town: I don’t make a living playing poker, I’ve never had the bankroll to even try, and apart from last summer when I was working for the World Series, I haven’t even made significant money as a poker writer, much less as a player (a couple of those PokerNews articles came out to something like $1/hour) and this gig pays zero. I wasn’t on a miracle heater. Variance being what it is, it would certainly be possible for someone to hit a hot streak during a four-game series. But that was not what happened. Instead, I got the trophy for in-the-money finishes of 24th and 11th. I didn’t even make a final table. I’m laughing on the inside. That is my smile. The funniest thing about this to me is that after seeing the numbers from the first weekend’s results, I approached Brian Sarchi at Portland Meadows early Saturday about possibly using something like the WSOP Circuit point model, little knowing I would be named Champion by the system I was arguing against (Max Young later mentioned he’d suggested the same change after the last series). Points were awarded to players who cashed, by the order in which they busted. So if a tournament had 36 players making the money, the winner got 36 points, the runner-up got 35, and so on down to 36th place getting 1 point (the formula for this is numberOfCashingPlayers – cashingPosition + 1). The problem with that kind of a point system is when you have unequal numbers of players getting points. If all four events had awarded points only to the top 20 finishers or the final 9, it’s not an issue. But if the number of payouts is based on the number of entries and some of the tournaments are re-entry and others are rebuys, the re-entry tournaments are going to have more payouts, producing more points for the leaders and for middle-of-the-pack finishers. I cashed in both of the re-entry tournaments. My first cash was in 24th place out of 45 cashing players. For that, I got 22 points (45 – 24 + 1 = 22). The folks who made the final table of the rebuy tournament the night before—with 27 players cashing—got between 19 (for 9th place and 27 (for first). So for a 24th-place finish, I ended up with as many points as the Friday night player who made 6th. Early in the last tournament, after results from Event #3 had been tallied, Brian announced that the series leader had 65 points. The final event had over 400 entries, with 54 places paid, and by about 9pm, I was the only player remaining in the field with enough points from previous events who could overtake the point leader. Brian told me that if I managed to get to 11th place or better, I’d pick up the needed 44 points. So that became my goal. Max, who was moved to couple spots to my left with a pile of chips after we’d hit the money (which happened about 8:30pm), seemed intent on making it his mission to make sure I didn’t get there. About 11pm, with 20 or so players remaining, I picked up aces for the fifth time in the game and raised to 50K (2.5bb) and Max 3-bet to 125K (which I was counting on). Another player went all-in for 79K and I shoved about 400K. Max considered it (he had me covered by several hundred thousand) then folded, only to spent the next few minutes debating whether he should have just flatted preflop, since he would have hit a set of nines on the flop. I did lay down a raise with A♥Q♥ to him not long after (he showed jacks) in my attempt to get the trophy, where I normally would have flatted his 3-bet, which was about a quarter of my remaining chips. Just before midnight we hit a break and the 12th player was eliminated, cementing my grip on the championship. I was pretty short by that point, with less than 10bb, and I shoved K♥9♥ only to have Max wake up with A♥T♥. So 11th I needed to make and 11th is what I got. I’d like to say thanks to everyone who was egging me on the last couple of hours. 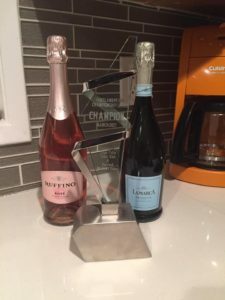 It was a fun goal, and while I wouldn’t exactly say that I’m not worthy of this type of award, I’m definitely a bit embarrassed to win it the way I did, getting less than 1% of the combined prize pool. A lot of people did better than me during this series. Just for comparison, under the WSOP Circuit model, the winners of the events would have received 50 points each, and everyone in the final nine would get a graduated amount down to 15 points for 9th place. My 24th place the first Saturday would have been worth 5 points and the 11th place that clinched me the championship would have been 10 points, equal to the points someone who cashed once in 9th place. I may not be a serious champion, but I plan to take the championship seriously! I’ll be out of circulation for a couple of weeks attending to some family business, but I will be dragging my trophy to every tournament I play after that for a month or so. After two weeks and $160K of combined prizes in the PPCS (plus the WSOP Main Event seat from The Game), things are a little laid back, with no specials that I’m aware of. Just a reminder that Portland Meadows and Final Table are now charging $15/day for their door fees. and there’s a new schedule for Meadows, with some Freezeouts on the schedule. And Final Table is getting your weekends going early with 11am start times for their first Saturday and Sunday tournaments (super-early if you were there the morning of Daylight Savings Time). The World Series of Poker Circuit at The Bike is over but the Winnin’ o’ the Green series continues this weekend with Mega Millions XVI, a $1M GTD tournament with eleven starting days and multiple flights each day, inclluding the option to enter for $160 or $550, with different Day 2 advancement criteria. Deepstacks Poker Tour Calgary is at the Grey Eagle Casino.The C$250K GTD Main Event (C$1,100 buyin) has entry flights on Friday and Saturday, with Day 2 on Sunday. The Venetian March Weekend Extravaganza runs through Sunday. The big event is a $600 buyin $200K GTD with three entry days. The Venetian Deepstack Extravaganza III kicks off a week after it’s over. How time flies. The Muckleshoot Spring Poker Classic runs today through Monday. The Shootour is today at noon, with events building to Sunday’s $20K added $750 buyin Main Event (noon). WPTDeepstacks Reno at the Atlantis starts tomorrow and runs until 27 March. They have an opening $50K GTD event ($400 buyin) and a $200K GTD Main Event ($1,100 buyin, starting 24 March). Little Creek Casino in Shelton, Washington is running satellites for a package including a WSOP Colossus buyin and $750 in travel expenses next Tuesday night at 7pm, with another on the following Tuesday. Tickets are available online. The Mid-States Poker Tour returns to Golden Gates Poker Room in Black Hawk, Colorado for two weeks on Monday with satellites, with the first event, a $100K GTD, $360 buyin starting Thursday. Next Friday is the start of the Planet Hollywood Goliath Warm Up, with $1M in combined guarantees, including the $529,850 HTD Main Event with a $1,650 buyin, three entry days (30 March–1 April). Tulalip’s Last Sunday of the Month tournament is 26 March for a $290 (with dealer addon) $25K GTD tournament with 30-minute levels. They’re also offering a weekly $60 No Chop NLHE tournament on Sundays. 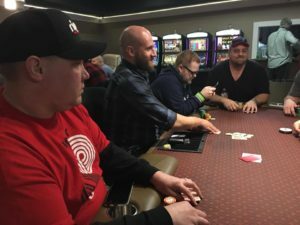 The Heartland Poker Tour has done well in St. Charles, Missouri, outside of St. Louis. They’re back there on 29 March with an opening $350 buyin, $100K GTD. Their $1,650 buyin Main Event (live streamed, no longer televised) starts 7 April. Alaska and Southwest both have direct flights to St. Louis from PDX, you can get RT tickets on Alaska for about $425. (St. Charles is about 8 miles from the airport). Russia’s in the news a lot lately. I’ve long been interested in Russia, from an historical perspective, as a fan of Constructivist poster art, because of a fascination with non-Roman letterforms, and because part of my wife’s family is of Russian origin. In fact, there are so many Russian emigres in the Portland area that Russian is the 3rd most-spoken language in Oregon—behind English and Spanish—and I know some of them are playing poker. I know that I’ve always wanted to go see Russia someday myself. So if the thought of carrying a wad of cash into Russia (or trying to get your winnings out of Russia) doesn’t scare you, hop on the computer right now. There are Russian women—who have to warm their own hands by blowing on them—waiting by the phone. The stop after Sochi (in early May) is in Montreal, with a $5M GTD at Playground Poker Club. The flight’s shorter but they speak French, so for some of you it may be a wash.
@pokermutant @partypoker And PokerStars heading there end of May just before the WSOP. The first two events of the PPCS2 are complete, and the race is on for the championship. Plus lots of money. There’s a trophy for the series point leader (at right) and the two biggest events are yet to come with two $30K GTDs at Final Table Friday night at 7pm and Portland Meadows at noon Saturday. 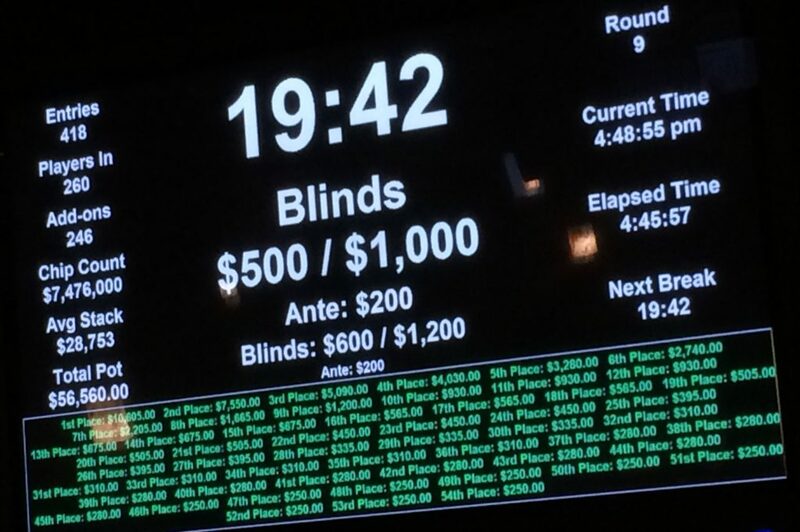 The prize pool in last Friday’s $20K GTD at Final Table was over $35K. The Saturday game at Portland Meadows had 368 entries and a total of more than $45K in money awarded to 45 players. I went on a heater just after the first break at Final Table, wiping out the stach of the table chip leader in consecutive hands that took me from 17K to 43K early on. The, near the second (addon) break, I lost everything I’d gained and more, got the addon, and was out on the third hand after break. Went home and got into a 70-player onliine 6-Max tournament, took third place, and made back my buyins, at least. Saturday at Portland Meadows went a bit better, despite being card-dead after getting aces under the gun and queens on my big blind in the second level. I did not know there were that many variations on 4x7x. I got lucky with AxKx on the button when a player in early position shoved 16bb near the end of the 400/800 level, I reshoved for 33bb, and the player in the small blind tanked for a while before he shoved with a bigger stack. The original raiser had AxQx and small blind had QxQx. I hit an ace on the turn, avoided a four-flush that would have sunk me, and started the 500/1K level with 70bb. I took a couple of chances, open-raising a hand with 4♠5♠ to 3bb and having a woman a couple of seats to my left re-raise me for a second time to 10bb off a relatively short stack. The flop was K♣J♣9♠, not what you would consider a good flop for my hand. I checked and she checked behind. The turn was K♠. I had her covered by about 30bb, and I shoved, then showed my bluff when I folded. I wouldn’t normally do that, but I was sort of setting myself up for something. About 25 minutes later, I limped into a multi-way pot from late position with 5♥6♥ and four players checked the Ax8♠5x flop, only to have 5♠ hit the turn. The big blind bet 2.5bb, and a player in middle position called, then I raised to 15bb. BB folds, MP tanks a long time, then finally calls. A low, non-spade on the river and I put another 25bb in with 10bb behind. MP tanked again for a long time, then called, only to ship most of his stack to my end of the table. Then I got up over 115K until I was in the big blind with K♠5♠ and action folded to a big stack in the small blind who fumbled a raise that ended up getting ruled a min-raise. I called and flopped two spades, called a half-pot flop bet, then hit the second nuts with a spade on the turn. The small blind put in 8K and I raised to 25K, only to have him call, and then a fourth spade hit the river and I had to fold to his all-in. He showed A♠Ax, naturally. We got to the money (45 players) after about nine hours but I was below average for the rest of the night. By ten hours I had about half the average stack and we were at three tables (I could now afford to pay my friend Daryl back; I’d had to borrow $40 for the addon because I hadn’t grabbed enough bills off my desk when I left the house). I was under 10bb at 100K when I shoved KxKx in late position and got a call from a much bigger stack on the button. He had AxQx and flopped JxTx9x, but I was still ahead 65%/35%. But Ax on the turn put a knife in my chances for a big payout. See you all Friday night at Final Table! 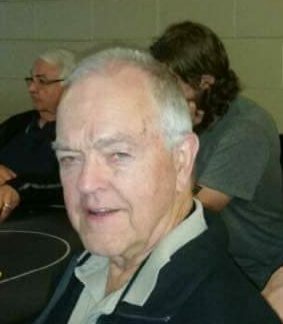 Last Sunday saw the late additon at Portland Meadows of a $2,800 Blaycation package that included an entry into the WSOP Colossus, travel expenses, coaching, and a week-long experience hosted by poker pro Bernard Lee. Brian Sarchi at PM said there may be more of these on the way. 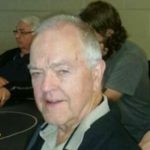 Monday at Final Table was a special morning tournament/going-away party for Jack McGiffin, who I mentioned here last month; he’s off to Merrie Olde England for retirement. He’s taking a few dollars along with him, since he was in the final chop in the Friday night $20K. This week, of course, are the final two events in the Portland Poker Championship Series II. A reminder that both venues have increased their door fees to $15/day. Saturday at 4pm at The Game is the final WSOP Satellite Event of their spring season. It’s the big one, a $100 buyin with unlimited rebuys and a $50 addon for a chance to win a seat to the $10,000 Main Event. There’s an 80-player cap on the event, you can reserve a seat at the front desk, and they’re serving a Parmesan chicken dinner for $10 from 3pm to 8pm. Chinook Winds is notoriously close-mouthed about posting winners of their series, but the top three finishers of the recent PacWest Poker Classic are now available, via Devin Sweet. @limonpoker I feel sorry for poker mutant! He must really need friends! Limon did once call me the most self-loathing poker player he’d ever met. About five minutes after the first time we’d ever talked. My advice: don’t get into a situation where he can possibly get a read on you. Then again, I’m not so self-loathing as to pass up a “god among men” shout-out. The Little Creek Casino in Shelton, Washington is only a couple of hours to the north. I’ve never made it up there myself, but it seems to have some decent poker action. 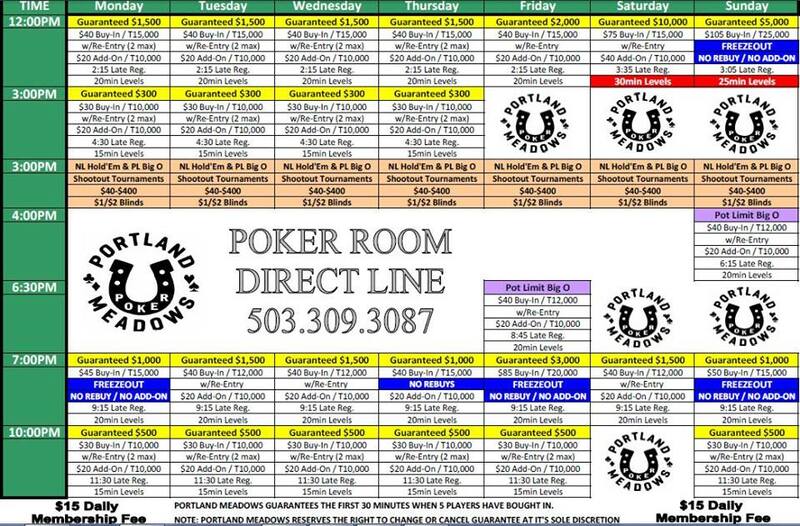 In addition to this week’s South Sound Poker Championship (see below), they’re running WSOP satellites for the Colossus (every Tuesday in March at 7pm, $155 entry for a package including a $565 seat and $750 in expenses), and to the Millionaire Maker (every Tuesday in April at 7pm, $255 buyin plus dealer addon for a $1,500 seat and $750 in expenses). Only have time to make one or two events at the Wildhorse Spring Poker Round-Up and wish there was some way to get there that didn’t eat up as much time as driving four hours out the Gorge into the high plateau (which can have some icy thrills even in the early spring)? There used to be air service through Seaport, a small carrier that flew from the private terminal at PDX. 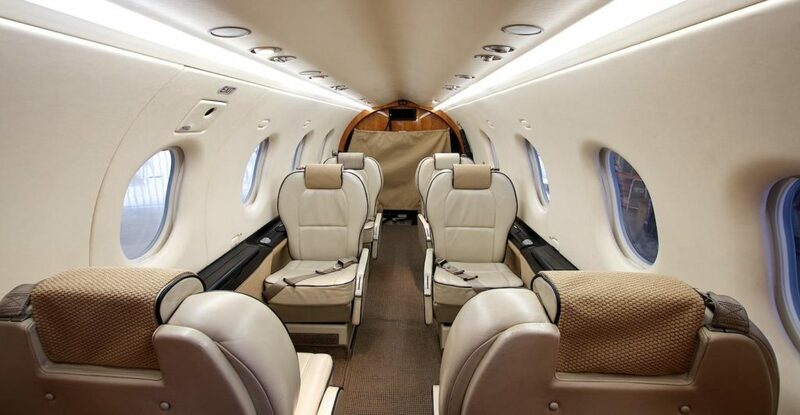 They went under a year or so ago, but along comes Boutique Air (“Fly Private for the Cost of Commercial”), which operates prop planes on three flights a day between PDX and Pendleton. Want to go out for the High Roller and come back after the Main Event? You can get a non-refundable economy seat for the 1-hour flight for $49 each way ($90 refundable). The trip’s just an hour, the first flight to Pendleton is at 8am, and you can be back before 8am Monday morning. It’s going to be more expensive than driving out, but if you can only make a day or two, it might just be worth it to keep yourself rested. Yes, it’s kind of claustrophobic-looking but it’s still bigger than your car. 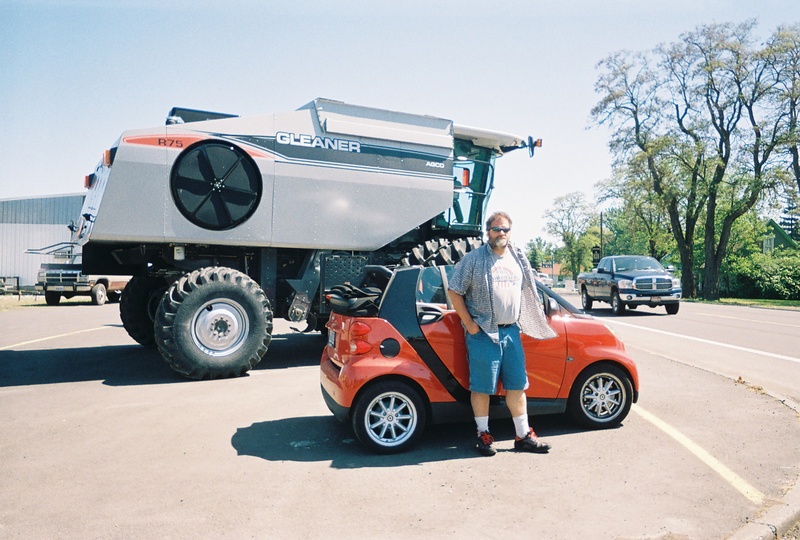 Definitely bigger than my car. Tonight is the last Wednesday satellite for the Muckleshoot Spring Poker Classic. The series begins next Wednesday. The WPT Bay 101 Shooting Star has a 3pm Turbo ($2,100 buyin) today and a 4pm $25K buyin High Roller. There were more than 800 entries in the Main Event before closwe of registration yesterday. The Wynn Spring Classic has a Survivor tournament at noon today, with a $250K GTD event starting Thursday–Saturday ($600 entry). Sunday is the final day of the $250K, and a $400 buyin $40K GTD. The World Series of Poker Circuit event at The Bike has started, interspersed with their Winnin’ o’ the Green series. You might still have time to get down there for the 2pm PL Stud 8/Big O mix today ($240 buyin, $10K GTD) or the $355 Survivor (top 10% get $3K). The $265 NLHE 6-Max starts tomorrow, there’s a big bounty tournament, and the nightly WSOPC Main Event satellite. Friday is a bigger Survivor at 5pm, and Satueday is the first flight of the WSOPC Main Event ($1,675 entry). The new Bicycle Hotel is offering 20% off rooms during March with use of the WSOPC17 code. The South Sound Poker Championship at Little Creek Casino has a $150 Bounty tournament ($1K added to prize pool) today, Thursday is $120 NLHE ($1K added). Friday is a regular $180 NLHE tournament. 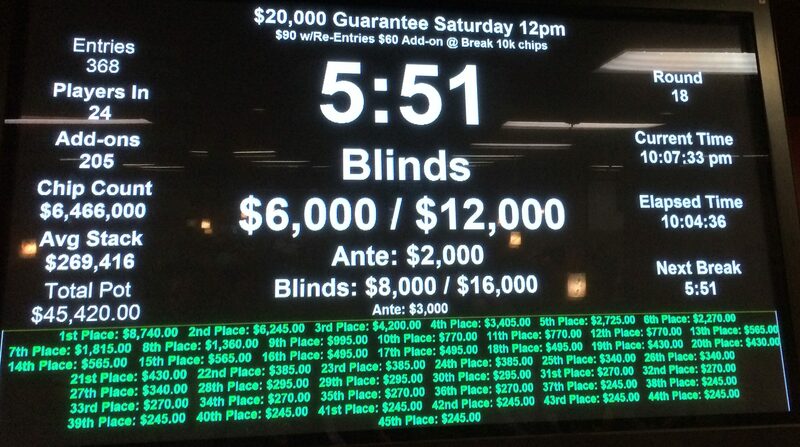 Saturday is the big $340 buyin tournament with $5K added to the prize pool. Then Sunday is a Last Chance Survivor ($127 buyin). The Thursday event starts at 7pm, all others begin at 11am. Little Creek’s WSOP Tuesday night satellites (see above) start up next week. As the WPT nears the end of its run at Bay 101, it makes the second stop it the annual “California Swing” at Thunder Valley outside of Sacramento. The Rolling Thunder Main Event ($3,500) is half the buyin of the Shooting Star, and the field is typically smaller (400+ compared to Bay 101’s 700+). There are lots of multi-table satellites (beginning Sunday) and other events, including a $250K GTD (starting days Wednesday through Friday), a one-day $100K GTD ($1,100 buyin) Friday, and a $1,100 Bounty tournament where the payout for knocking out a player is $500. Deepstacks Poker Tour (officially merged with rhe WPT last month after several years of working together, but still running separately in Canada) are in Calgary starting Friday at the Grey Eagle. It opens with a C$100K GTD on Friday (C$550 buyin), features HORSE, PLO, and Survivor tournaments, and wraps up with either a C$300K or C$250K GTD Main Event, depending on which part of the schedule you look at. The Canadian dollar is currently at about 76¢US. Gardens Casino in LA has an ad in the latest issue of CardPlayer nothing on their websitefor a $50K GTD game ($175 buyin with $100 addon) at 5pm on Friday, but there’s that I can find. The Venetian March Weekend Extravaganza starts 14 March (Tuesday) and runs through Sunday. The big event is a $600 buyin $200K GTD with three entry days. The Venetian Deepstack Extravaganza III kicks off a week after it’s over. How time flies. WPTDeepstacks Reno is at the Atlantis starting 16 March and running until 27 March. They have an opening $50K GTD event ($400 buyin) and a $200K GTD Main Event ($1,100 buyin, starting 24 March). 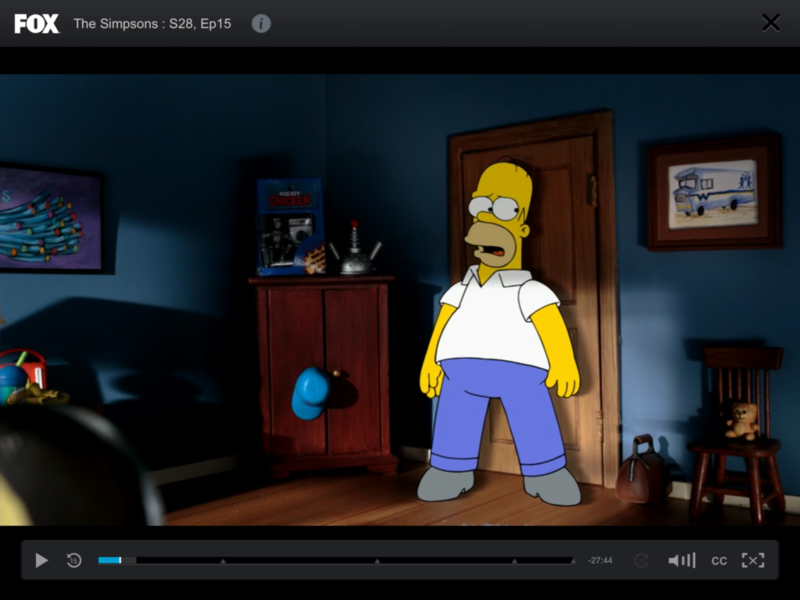 I stole the design for my 3D-printed card caps from an accessory on a Simpsons figurine, and last week it showed up in the “couch gag” opener of the show, as Homer searches through the animated worlds of South Park, the California Raisins set, and the Nerd from Robot Chicken, to find the iconic ship painting that hangs over the family’s couch. TMI? It’s here! This weekend and next! Frankly, for me poker Twitter without a slice of Limon is dull poker Twitter. And Tuesday morning—despite having sworn off of social media and leaving his gig at Live at the Bike in February—he tried out Twitter only to find he was un-banned. The world was then full of light. And the c-word. There’s a load of news I was wanting to cover. Max Young’s position on the WSOP Circuit Leaderboard that could net him a seat at this year’s Global Casino Championship, Jacque Lavadour‘s run in the WSOPC Rio Monster Stack or Liz Tedder‘s 3rd-place finish in the HORSE, but my evening got sucked up by another cash in the Ignition Casino Thousandaire Maker, so I’m going to have to cut this short. With the good (the afore-mentioned Portland Poker Championship Series II) comes the not-so-good: this is the week Final Table and Portland Meadows raise door fees to $15/day. This isn’t so much of a big deal to the cash game players—$5 is just a straddle to them—but for someone like the daily 11am Final Table tournament with a $20 buyin, that extra $25/week can add up (I’m speaking from experience). Have you been poring over your WSOP schedule? I have started to give it a personal look, although I’ve never actually played more than two tournaments a season there that weren’t the dailies. But this may be the year I step it up a bit. First off, I intend to make use of WSOP.com. They’re already running a variety of satellites to events ranging from the online bracelet events to the Colossus, to the Main Event. They currently run on Sunday, but as the WSOP gets under way, there should be MTTs for specific events a day or two before they start. The first game on my schedule is 3 June, Event #8, $333,333 GTD NLHE. It’s a $333 buyin on Saturday afternoon, and just one day. Sunday, there should be plenty of satellites to events through the next week. Monday is Event #11, $1,500 Dealers Choice 6-Handed, then Event #14, $1,500 HORSE on Wednesday (an event I covered for WSOP.com last year). Event #16, $1,500 NLHE 6-Max is Thursday (in case the HORSE doesn’t work out), then Friday is the start of Event #18, $565 PLO. I think that’s a pretty good set of tournaments to set sights on. And there’s plenty of other series going on if things don’t work out. Commerce Casino‘s LA Poker Classic ends tomorrow with the final day of taping for the WPT Main Event. The last event is a $1,100 1-day $100K GTD NLHE Bounty tournament tomorrow at 2pm. There’s no prize pool! You get $1,000 for every player you eliminate (the other $100 of your buyin is fees). Then once things get down to the final nine players, it turns into a winner take all for the last $9K. Interesting concept. No laddering! Tonight is another Wednesday satellite for the Muckleshoot Spring Poker Classic. The series begins two weeks from today. $1,100 mega satellites for the WPT Bay 101 Shooting Star start tomorrow. There’s a $2,100 two-day event starting Sunday (only 250 players and 50 alternates), and another $2,100 Turbo and a $25K High Roller on Wednesday. The Shooting Star Main Event has starting days on Monday and Tuesday. The Wynn Spring Classic has a $750K GTD championship ($1,600 entry) with entry days Thursday, Friday, and Saturday, with the final day on Sunday. The Stones Gambling Hall $250,000 Spring Classic is coming to a close with three entry flights to their $125K GTD Main Event Thursday through Saturday (10am each day). It’s a $450 buyin, with the final day on Sunday. The World Series of Poker Circuit event at The Bike is part of their Winnin’ o’ the Green series. It starts Friday and runs through the end of the month. The first WSOPC event is Saturday, 4 March, with the Main event beginning the next Saturday. Mega Millions XVI starts on St. Patricks’s Day, with 22 entry flights over 11 days, with a $160 buyin, and $100 addon, with a $1M GTD prize pool. The South Sound Poker Championship at Little Creek Casino in Shelton—west of Olympia—starts Monday with a Super Satellite tournament ($50 including dealer addon). Super Satellite for what? Well you’ll need to call the poker room for that, but Tuesday is a $125 NLHE Seniors game, Wednesday is a $150 Bounty tournament ($1K added to prize pool), Thursday is $120 NLHE ($1K added). Next Friday is a regular $180 NLHE tournament. Saturday (11 March) is the big $340 buyin tournament with $5K added to the prize pool. Then Sunday is a Last Chance Survivor ($127 buyin). Monday and Thursday events start at 7pm, all others begin at 11am. As the WPT nears the end of its run at Bay 101, it makes the second stop it the annual “California Swing” at Thunder Valley outside of Sacramento. The Rolling Thunder Main Event ($3,500) is half the buyin of the Shooting Star, and the field is typically smaller (400+ compared to Bay 101’s 700+). There are lots of multi-table satellites (beginning Sunday) and other events, including next week’s $250K GTD (starting days Wednesday through Friday), a one-day $100K GTD ($1,100 buyin) next Friday, and a $1,100 Bounty tournament where the payout for knocking out a player is $500. Deepstacks Poker Tour (officially merged with rhe WPT last month after several years of working together, but still running separately in Canada) are in Calgary starting 10 March at the Grey Eagle. It opens with a C$100K GTD on Friday (C$550 buyin), features HORSE, PLO, and Survivor tournaments, and wraps up with either a C$300K or C$250K GTD Main Event, depending on which part of the schedule you look at. The Canadian dollar is currently at about 76¢US. Gardens Casino in LA has an ad in the latest issue of CardPlayer nothing on their websitefor a $50K GTD game ($175 buyin with $100 addon) at 5pm on 10 March, but there’s that I can find.